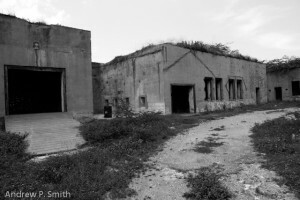 Fort Rocky is an abandoned fort located on Jamaica’s Palisadoes strip near the old pirate community of Port Royal. It is a forgotten and dilapidated part of the long and proud military heritage of this area. 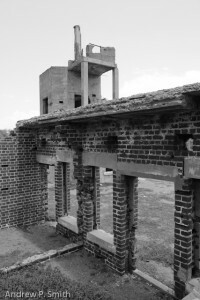 The central building of Fort Rocky. 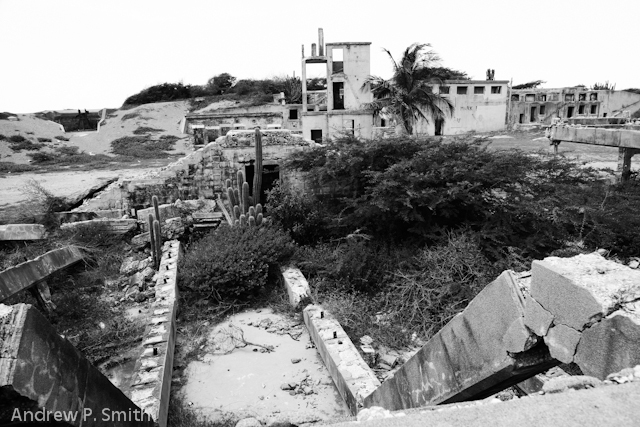 Although Port Royal is well-known as being described in the 17th century as “the wickedest city in the world” , it also has a long history as a military post. The British naval heritage is well represented by Fort Charles and Jamaica’s Coast Guard currently has its headquarters here. One of the many storerooms. Facts regarding the date of its construction are unclear. 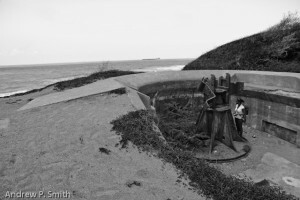 According to Merrick Needham in a letter to the Daily Gleaner in September 2007, it was built just before the first world war and up to the end of World War II, it consisted of “five six-inch coastal guns” and “had barracks accommodation for all of 82 officers and other ranks”. 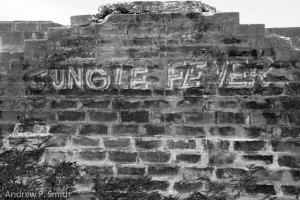 However, according to the web-site of the Jamaica National Heritage Trust that states that: “Fort Rocky, the last of great forts, was constructed during World War II. It was erected as part of the effort to prevent German invasion on the island”. One of the abandoned structures. Graffiti on one of the walls. As can be seen from these photos taken earlier this month, the location is still intact and with the right plan, it could become an attraction for those interested in military history. However, when I visited the site two weeks ago, there was no informational sign about the fort visible on the Palisadoes main road. The only sign present stated that it is a venue available for hosting events. Last Saturday I took a group of students to the Palisadoes strip, a tombolo that connects the old pirate town of Port Royal to Kingston. The aim was for them to gain a greater appreciation for the qualities of natural outdoor light and also for them to photograph creatively, applying compositional and lighting guidelines on a beach at sunrise by Plumb Point. However that morning I came across a discovery that I had not seen before, although I have been taking photography students here over several years. 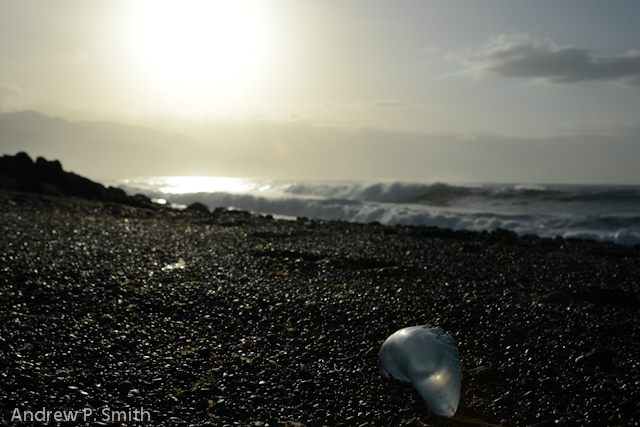 A Portuguese-Man-of War on a beach on the Palisadoes Strip. While simultaneously keeping an eye on the group and giving them individual advice one of the students walked up to me from the beach with two plastic-looking objects in his hands and asked me “what are these?” I admitted that I had no clue, but I found them highly photogenic. 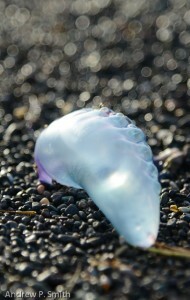 I then messaged the family’s resident zoologists who eventually informed me that they were Portuguese Man-of-Wars. Big brother then added “they sting very bad. Even after death”. I wish I had known that BEFORE I picked them up to compose them ‘just right’. In spite of popular belief, the Portuguese Man-of-War is not a jellyfish but is in fact a colony of organisms known as a siphonophore. The gas-filled bladder (pneumatophore) is normally above water and below are the venomous tentacles, composed of nematocysts. For more information, you can check this National Geographic page. Fortunately the two found by my student did not have their tentacles attached, where their sting is housed. However, as I walked along the beach I noticed quite a few more, some which did have their tentacles.Yes, I did photograph all of them, challenging myself to be as creative as I expect my students to be. 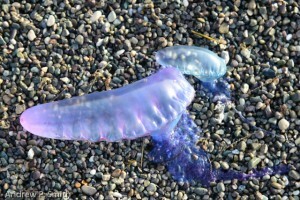 Later on I found out that it is quite common for Portuguese Man-of-Wars to be beached and when this happens, public warnings are made in order to avoid any fatalities. I have never heard of such a warning in Jamaica, which highlights the need for such public education. Last Friday June 7, Jamaica’s Reggae Boyz football team played the United States in a vital world cup qualifying match in Kingston. Jamaica came into the match at the bottom of the six-team CONCACAF qualifying group with two points from four matches and had to win to have any chance of progressing to Rio 2014, either as one of the three automatic qualifiers or as the forth-placed team that will play-off against New Zealand. The Reggae Boyz played with more purpose and passion than in their previous match three days earlier that they lost 1-0 to Mexico. Against the United States they attacked with purpose and were unfortunate to go into half-time behind by 1-0, thanks to a 30th minute goal from Jozy Altidore. In the second half, Jamaica kept up the pressure and equalised through Jermaine Beckford in the 89th minute which gave faith to the remaining faithful supporters that Jamaica would not leave empty-handed. This was not be however, as Brad Evans scored the winning goal in the 92nd minute. The win put the USA into second place in the CONCACAF zone with 7 points from four matches, tied with Costa Rica and Mexico while Jamaica remain at the bottom of the group with two points from five matches.